Is It Tough To Preach There? If time flies when you’re having fun, it seems to break the sound barrier when you’re busy living out your life’s calling. After eight weeks that I will forever remember at our parish in Triangle, VA, I find myself back at Holy Name College in Silver Spring, MD wondering what just happened. Part of me is in denial. I only started packing to leave an hour before I left, and didn’t even hint at saying goodbye to any of the parish staff until I was packed and ready to go. I sit here in my room half expecting to head back in a few days, but that is not the case. I do not know if or when I will return, but I do know that it has been (dare I be so bold…) my favorite period of being a friar thus far. For some, this might be surprising given the reputation of the parish. The parish does not have a bad reputation by any means, but before I visited and ultimately decided on it, there seemed to be an obligatory question friars asked when mentioning the parish: “Is it tough to preach there?” What they meant by this was that the influence of the government and military (the marine base at Quantico is just .4 miles away and the parish is the home of many Pentagon and intelligence workers) was perceived to be a detriment to preaching freely about some difficult topics. How could one engage in works of social justice, challenge the culture of war and gun violence, and speak freely about the social ills of the country if everyone there was either a gun-toting conservative or a high-powered government agent that would be keeping tabs on anything controversial (not that either of these things is bad, I should note)? That was the perception I had of Triangle after three years in the Order, having visited the parish only once. Having now spent eight weeks there and leaving with actual experience preaching, do you want to know my answer? No, yes, and it’s a flawed question. Let me explain. For starters, the very reasons that some have cited as potentially off-putting are the very reasons that make it an incredible place to work and preach. Because let’s be honest: if you are interested in social justice and actually want to get things done, wouldn’t you want people in the pews who can make a serious difference in their work, say… FBI agents, people who protect and interact with the president on a regular basis, and oh, you know, generals in the armed forces. Sitting in their pews each week are the people that have the power to make incredibly influential decisions on behalf of our country, and are entrusted with the task of forming many young men and women entering these jobs. Rather than reading the New York Times op ed piece and forming an opinion, the people of this parish can go and speak to an actual person working in the Pentagon or investigating an issue on the ground and have a real conversation. This is an incredible resource. Is it tough to preach here? No. Quite the opposite: it’s better informed and more exciting. On the other hand, having these resources there do require a bit more work in preaching. Our preaching has to be done in a smart way. Unlike “easier” situations for preaching, congregations that are largely similar and everything we say is like “preaching to the choir,” one cannot get away with saying lazy answers or half-truths when those listening are well-informed and diverse. If everyone is conservative in the parish, you could get away with preaching about how there are abuses to the welfare system and the best way to help the poor is to make them “help themselves.” Popular, but not the Gospel. If everyone in the parish is liberal, you could get away with preaching that the entire reason people are poor is because of corporate greed and the top 1% of wealth-owners. Popular, but also not the Gospel. When a parish has the parishioners that St. Francis does, knowledgable and well-connected, and given the issues many have had with their previous churches, overwhelmingly diverse when it comes to the conservative/liberal scale, it can only be successful if it preaches carefully and invites all to the table. I saw this first hand working with the Care of Creation Committee on Pope Francis’ Laudato Si and the Economics Committee on wealth inequality. Both issues are very controversial. Both have the possibility of alienating parishioners. And yet arch-conservatives and flaming liberals (and of course, us normal people in between!) were able to come together, challenge one another, and not leave the conversation by flipping the table and storming off. Why? Because the conversation was incredibly intelligent, and more importantly, involved people that knew that the real answer had to include everyone. Is this a difficult environment to preach in? You bet. As a result, though, St. Francis is the most successful parish I know of in actually making a difference in social justice issues. How successful? While many churches have a food pantry and outreach program, which St. Francis does, it also has seven different Action and Advocacy groups. The Anti-Human Trafficking group, for instance, is so well-organized and ahead of the curve that two representatives of the parish were asked to present on effectively organizing a parish-run social action group at the Anti-Humam Trafficking conference organized by the United State Conference of Catholic Bishops a few weeks ago. That’s no small potatoes! It is a certified Green Faith parish, an active community organizer through the Virginians Organized for Interfaith Community Engagement (V.O.I.C.E.) organization, a major supporter of respect for life issues (a committee that includes but goes beyond abortion in its defense of the dignity of human life), and… well, you’re probably tired of me shamelessly selling this parish by now. But you get the point: it is a successful parish. So, is it tough to preach there? No, yes, and ultimately, it’s a faulty question. Because, really, shouldn’t it always be tough to preach somewhere? The Gospel is not easy to follow. It’s challenging. If it seems easy to preach and everyone agrees with what we’ve said, well then maybe we haven’t preached well. If we have picked a side and given people what they want, haven’t we also failed to be bridge-builders to those on the other side? Maybe we haven’t challenged our congregations, or maybe we haven’t challenged ourselves. At St. Francis, one can understand the apprehension to preach and its reputation, given the congregation. For me, though, that’s what all preaching should be, and I loved the opportunity to take part and the excitement of knowing that, if the Lord chose to work through me, and if I took the time to actually listen, I could effect change in the world in a way not possible other places. For me, that’s a tough situation, but not for the reasons some might thinks. Well written Brother Casey! We enjoyed having you around Saint Francis and hope you will pencil us in for a return visit. God Bless! Well said Brother Casey! May God bless you as you continue your Journey! 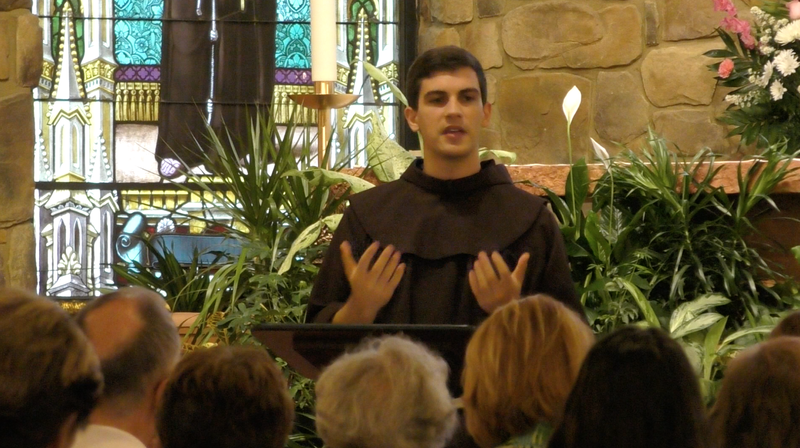 We have truly been Blessed at the parish to have such a gifted Friar visit with us. I give thanks to the FATHER for the time that we had. The LORD watch between me and thee, when we are absent one from another. Excellent analysis and good job of capturing the diversity and complexity of our congregation. Thanks for sharing the gifts you have acquired so far in your journey! Please stay connected to us and pray for us as we pray for you. Brother Casey, thank you for your work in “Catholic Boot Camp” and your Bible Study Group. While I was not able to attend many of the sessions, those I was able to participate in were intellectually stimulating and spiritually fulfilling. Thank you for your commitment to the Lord and your brothers and sisters in Christ. You are using your gifts well- thank you for choosing to share them so selflessly. God bless. Brother Casey, it was so wonderful to have a young man profess his faith so beautifully. As a mother of two sons in their twenties, I appreciated that you came to St. Francis and had the opportunity to interact with our young men and women. I hope you come back next summer. Also, one of the reasons that I love our parish is that the friars are so open, loving, and giving. It doesn’t seem to me that the proximity to Quantico and the Pentagon affects their preaching. I love every Mass at St. Francis. Thanks for coming to St. Francis !